Ying Gao, new project 'Possible Tomorrows' designed to emancipate us from political technology. Ying Gao‘s speciality is creative projects. Her work transcends technological experimentation. Previous wearable tech projects have included garments integrated with eye-tracking systems that move and light up when under someone’s gaze. Gao’s work stands out because she explores the construction of the garment, the garment’s function as a fragile protective space and questions the assumptions made about clothing. Her latest venture is called ‘Possible Tomorrows’. 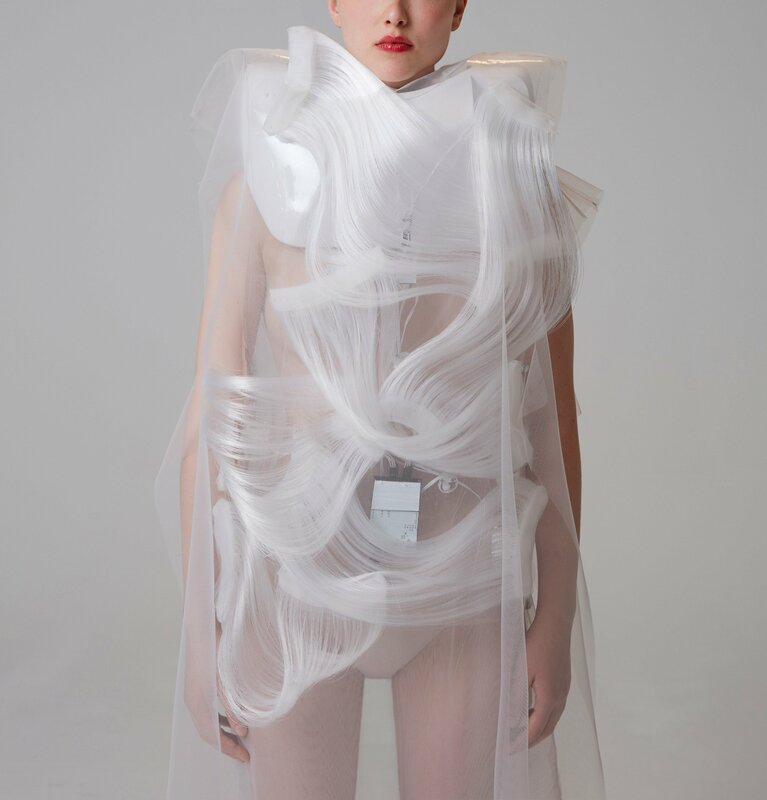 It is a project that lives and breathes the belief that design is the medium situated in the technological rather than in the textile realm and that sensory technologies allow garments to become more poetic and interactive. Goa is introducing us to interactive clothing with fingerprint recognition technology, the ‘Possible Tomorrows’ garments are made up of nylon mesh, nylon thread, PVDF thread, thermoplastic and electronic devices that can send data to a microprocessor that uses Arduino – an open-source electronics platform. The design was developed from a series of algorithms linked to the realm of pattern recognition, or scatter graph. The aesthetic and motion of these garments evoke hypotrochoids, shapes borrowed from the vintage game Spirograph: their flattened curves are drawn by a single point linked to a mobile circle that rolls without sliding on and inside of an initial circle.